Hydrate and rejuvenate while rebalancing skin and improving tone. 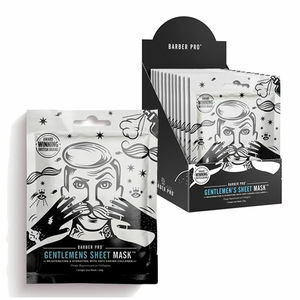 Barber Pro's Gentlemen's Sheet Mask offers a rejuvenating and hydrating treatment for the skin that instantly rebalances oily and dry patches while increasing elasticity and improving skin tone. The Mask utilises Marine Collagen, Green Tea Extract, Seaweed Extract, Boswellia Serrata Plant Extract, Pomegranate and Witch Hazel to create a treatment that results in softer, supple skin with a youthful glow. In particular, the powerful anti-oxidant and anti-bacterial properties of Green Tea extract target problematic skin, balancing and improving oily and dry conditions while reducing redness. It's an anti-aging and firmness-boosting treatment that takes just 15 minutes to achieve! It's suitable for all skin types, ready to use and is cut to the shape of the face. The Mask is also free of Mineral Oils, Lanolin, Petroleum and Parabens and hasn't been tested on animals. Comes in a 23-g sachet or a pack of 12 sachets. £2.94 (inc. VAT) Why no VAT? We're a trade wholesaler and quote our prices without VAT to help our VAT-registered customers understand the true cost of a purchase. Space-saving, counter-top hot towel steamer with a 60-minute timer and which holds up to 6 towels . Comes complete with wooden tweezer. Attractive gift set of men's skin care masks featuring ingredients like activated charcoal and collagen to revive your clients' skin. Kit contains: Gentlemen's Sheet Mask, Under Eye Mask, Foaming Mask, Face Putty Peel-Off Mask.